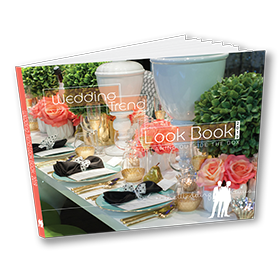 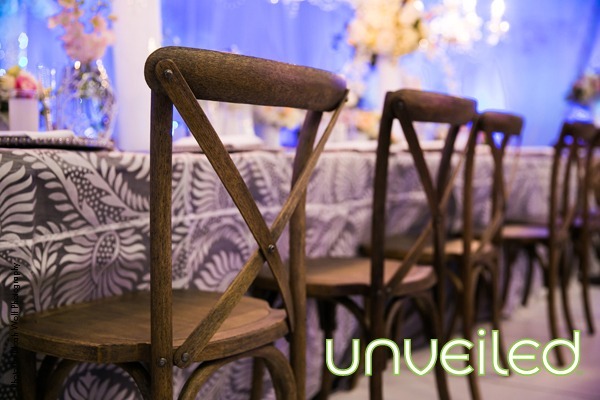 The Maker movement has had a large impact on wedding design. 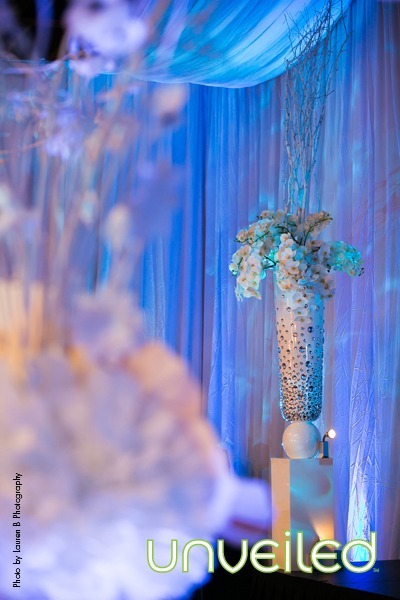 Hand crafted elements have become an important aspect to many celebrations. 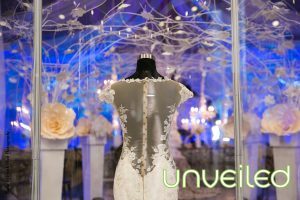 As we ventured toward creating a soft and ethereal design, we looked to the beautiful paper arts and plucked the paper flower as our romantic inspiration for: PETAL. 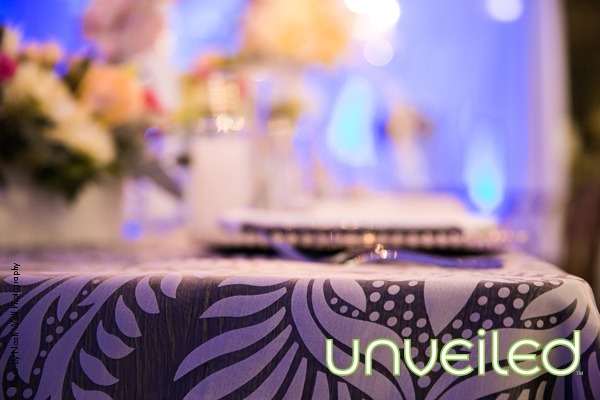 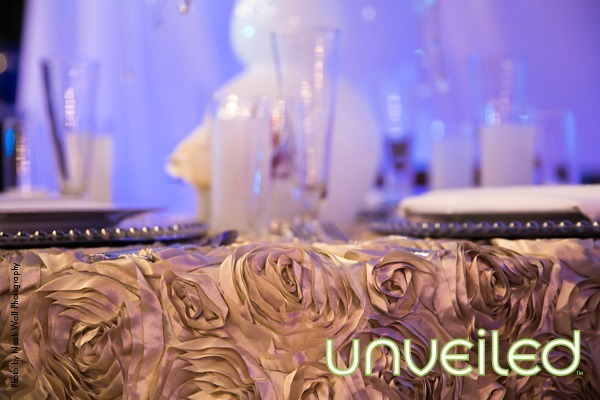 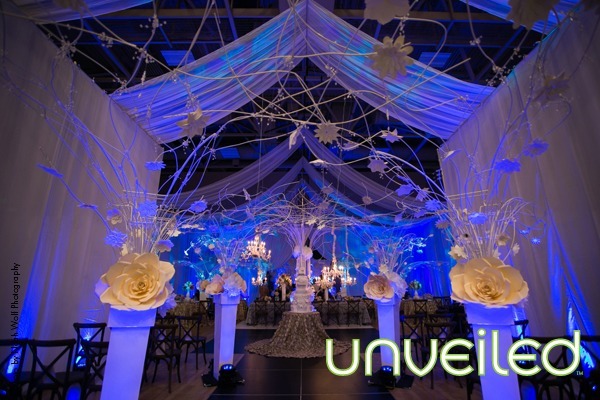 Our background would be pale white tones that we created with flowing, white fabrics. After wrapping the space with large white metal branches, we attached hundreds of handmade paper flowers to each branch. 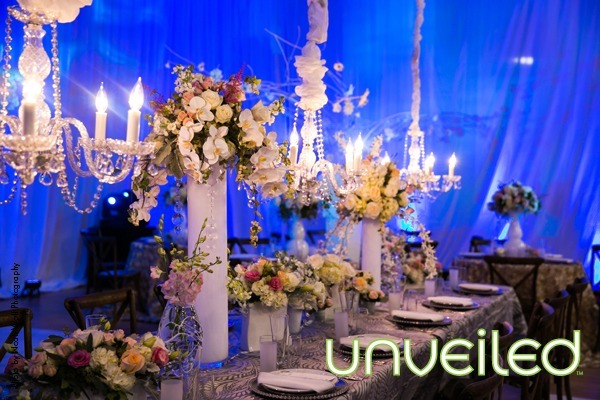 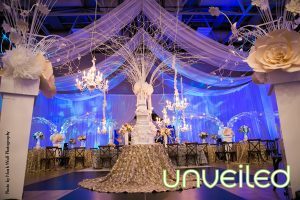 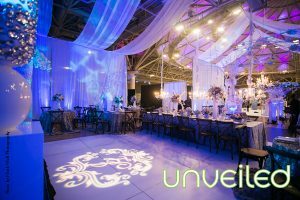 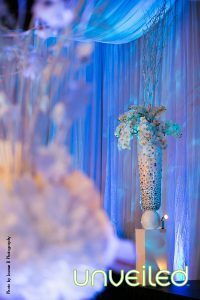 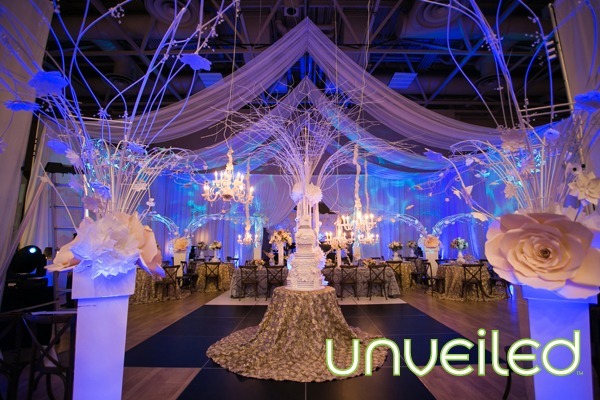 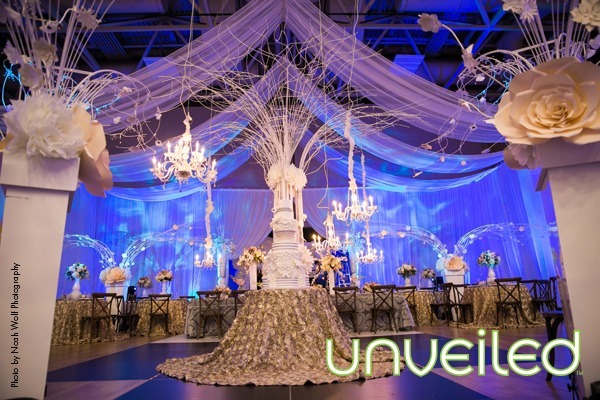 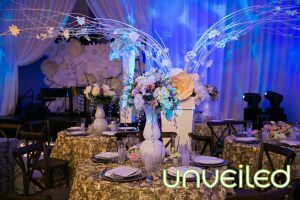 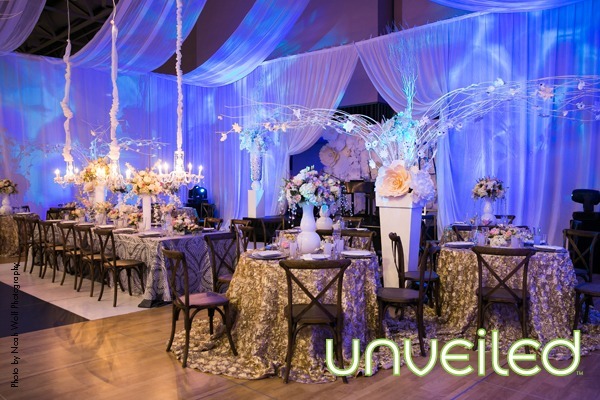 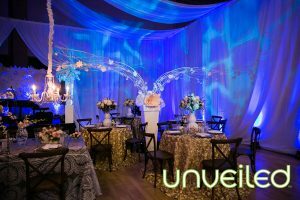 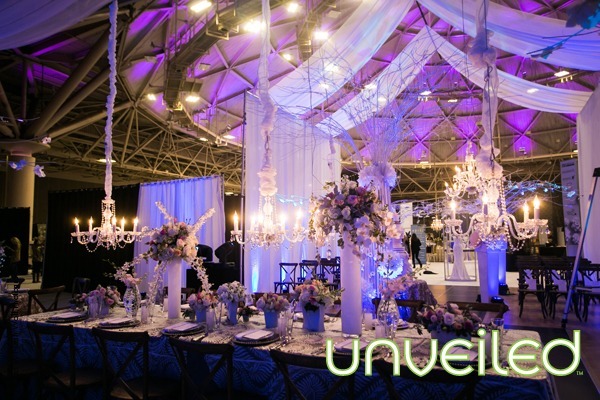 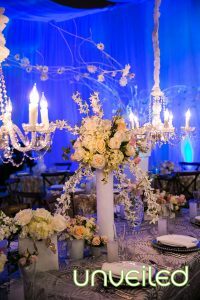 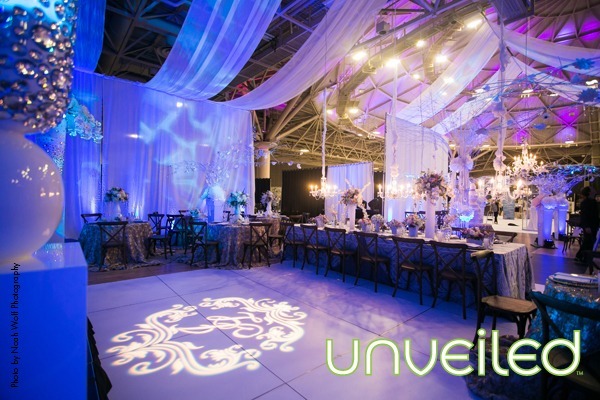 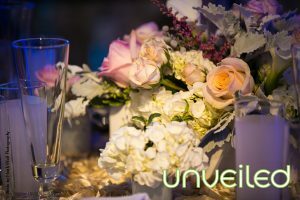 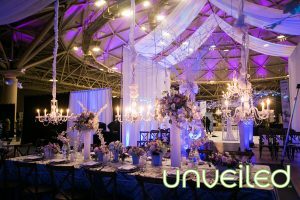 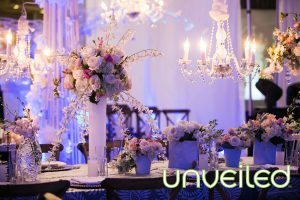 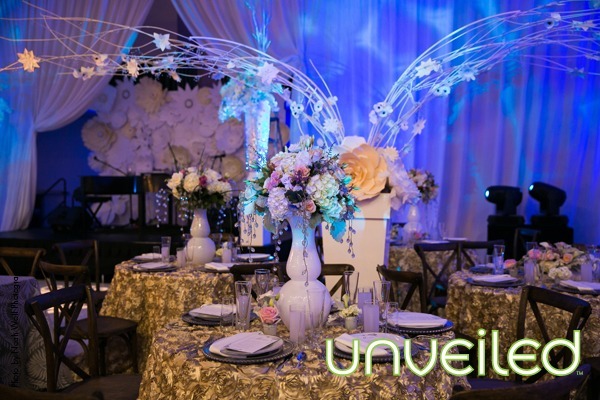 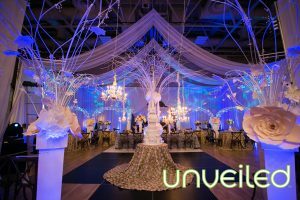 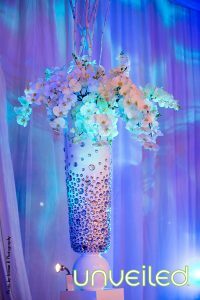 We were able to transform the space with dramatic event lighting while the white surfaces bounced the beautiful shades of ice blue, purple, amber and pinks, which transformed the space throughout the celebration. 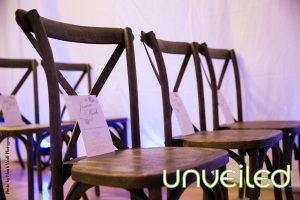 For the ceremony space, we selected natural cross-back wood chairs that were neatly placed in rows that added a woodland effect to the space. 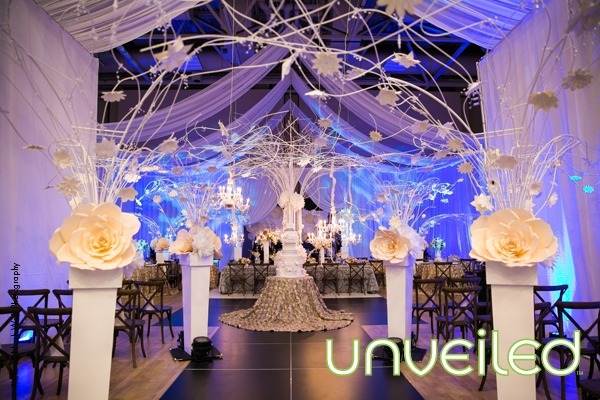 Down the aisle we placed tall metal urns in gloss white where tree-like metal branches sprung in white. These created a canopy over both the aisle and the ceremony seating. 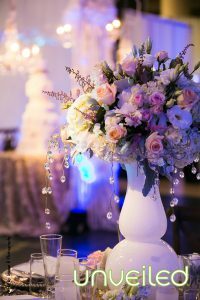 Atop each urn we placed a cluster of oversized paper flowers: large blush roses and ivory poms. 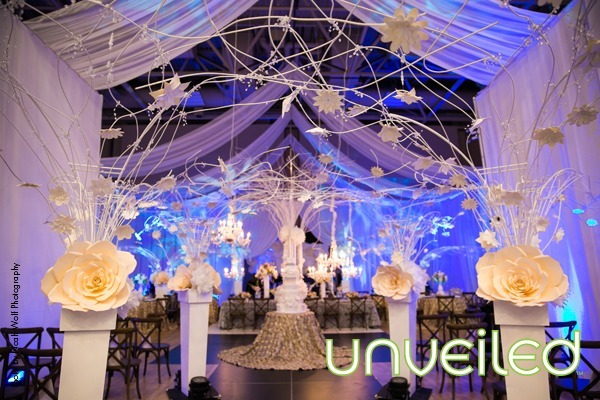 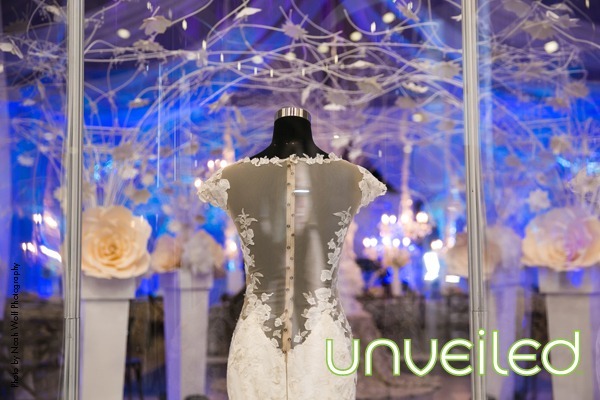 We attached a myriad of white and ivory blossoms to each of the twisted branches. For the altar, we constructed a towering metal tree which we adorned with paper flowers while floating chandeliers hung with shimmering crystals from its branches. Below the tree’s large canopy, we placed the stunning wedding cake, which featured hundreds of handmade sugar flowers. 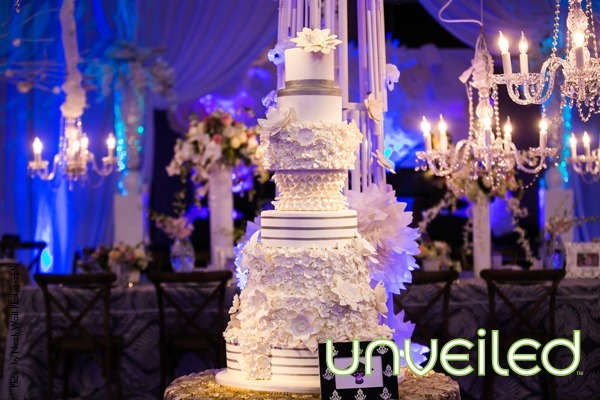 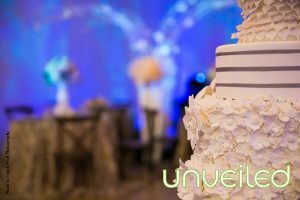 The eight-tiered cake featured silver banded accents and layers covered in flowers. 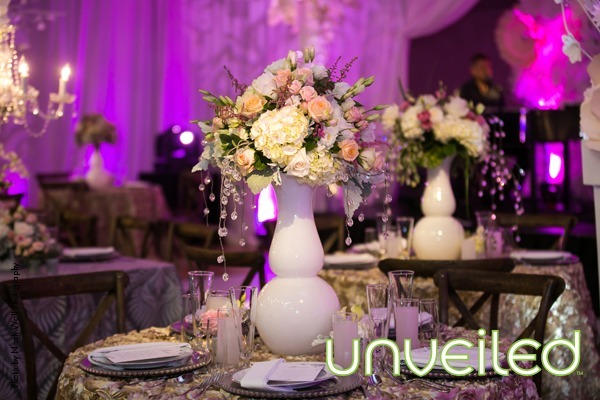 We placed this amazing centerpiece on top of a golden 3-D rose linen, which flowed gracefully onto the floor. 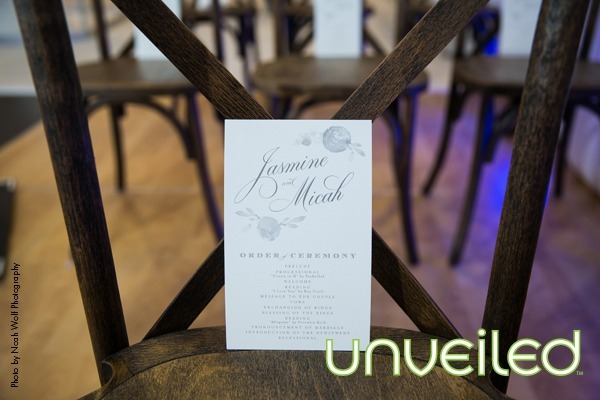 Again, we incorporated the beautiful cross-back wooden chairs into the reception seating beyond the altar, as well as the long harvest head table. 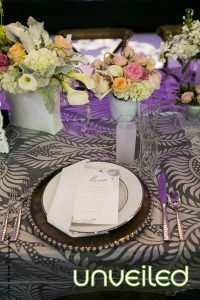 The head table was set with silver textured taffeta linens with a sheer ivory overlay that featured a dramatic paisley leaf motif to accent the large paper flowers. 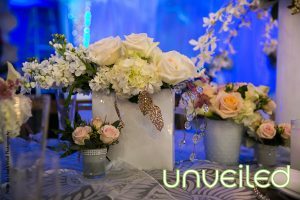 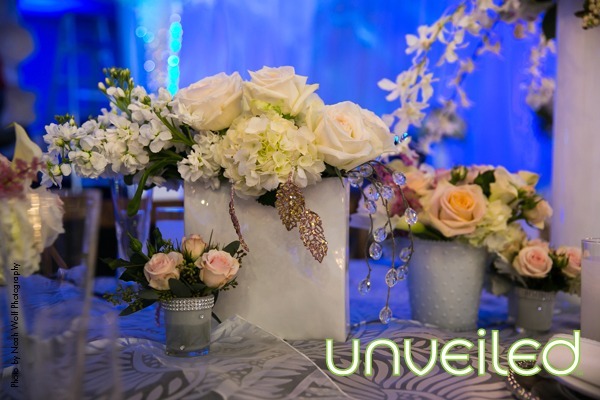 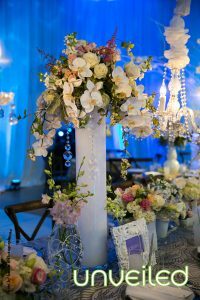 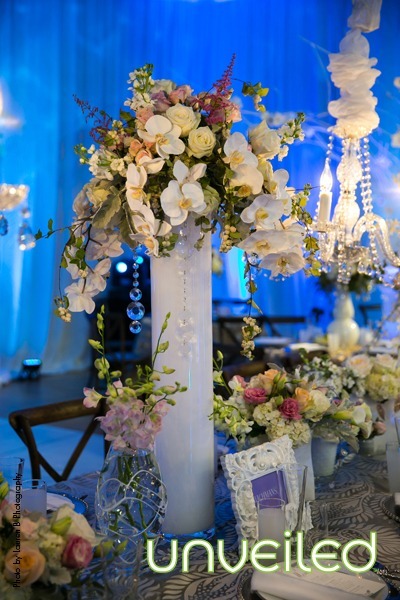 Along the length of the table, we scattered a mixture of loose floral arrangements, featuring roses, orchids and hydrangea in white gloss containers for a garden effect. 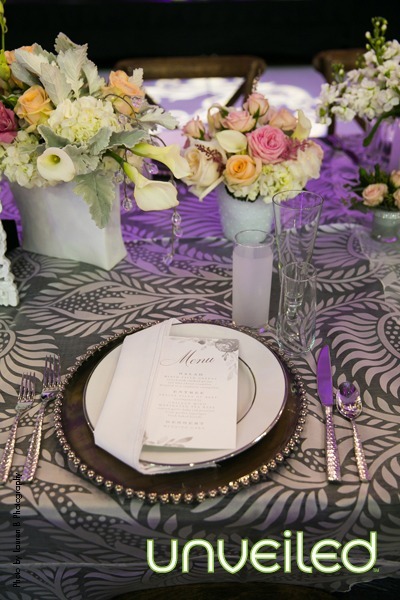 The place setting featured a unique double charger. The first layer was a rustic wooden charger upon which we placed a glass and silver beaded charger, which added a sophisticated edge to the more rustic wooden charger. To top it off, we set a classic white and silver china pattern, a silver edged cloth napkin and the silver and white menu card. 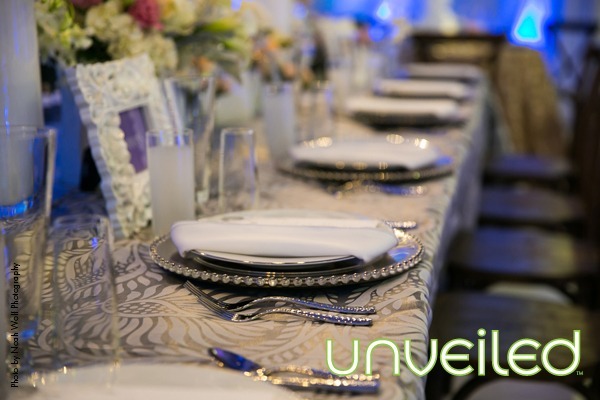 Hammered silver flatware and an eclectic mix of glassware, including a frosted water glass and stemless champagne glass. 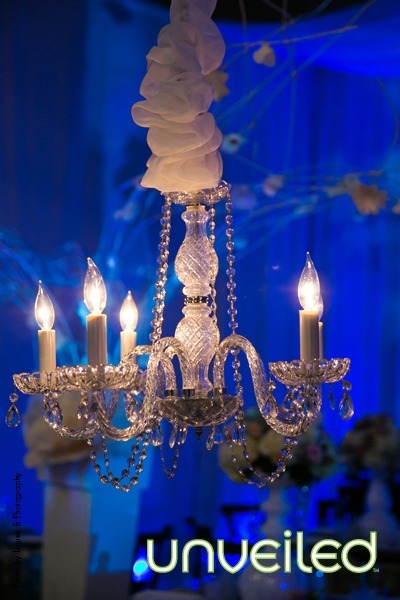 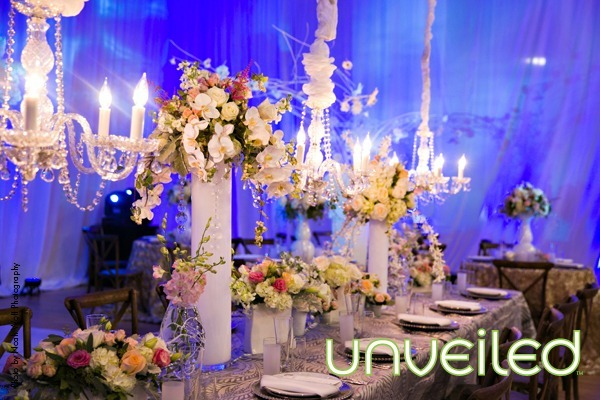 Above the head table hung three crystal chandeliers, adding a magical sparkle to the setting. 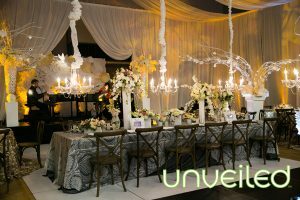 Guest tables were set with the coordinating golden rose linens and striking apothecary-inspired vases in floss white, dripping with lush floral and crystal accents. 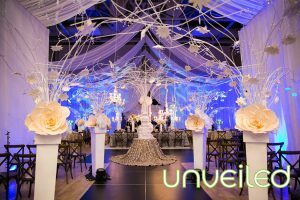 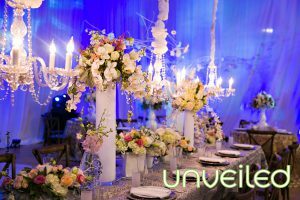 We clustered more large urns around the tables, along with branches that cascaded skyward to create another canopy over the reception. 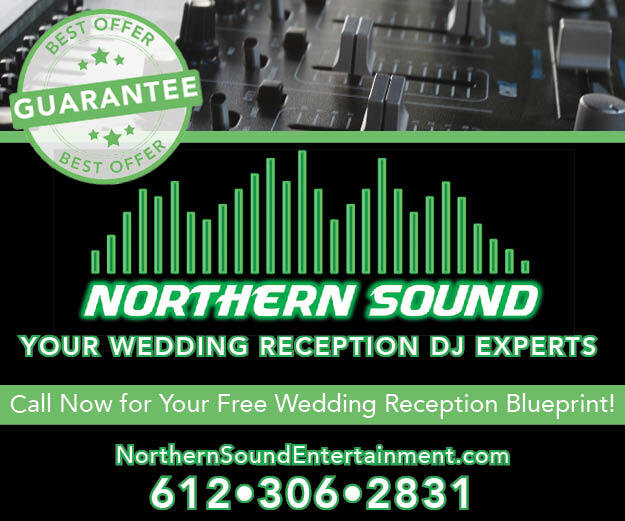 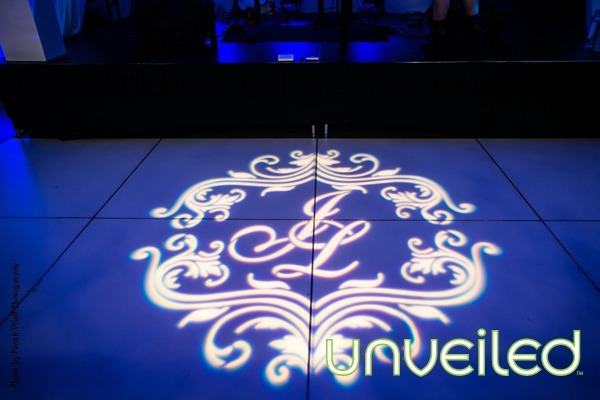 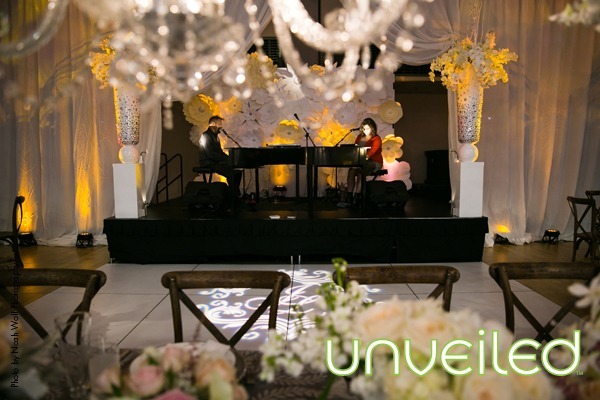 The white gloss dance floor featured a gobo with the monogram of the couple, while beyond the dance floor a stage was created for the dueling pianos performers. 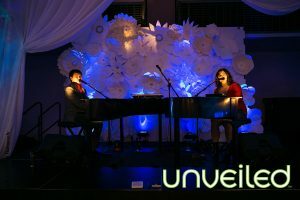 The entire stage’s back wall featured oversized paper flowers that were lit from below for a dramatic effect. 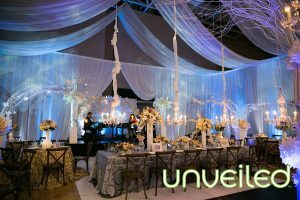 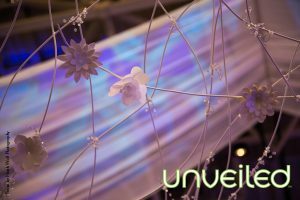 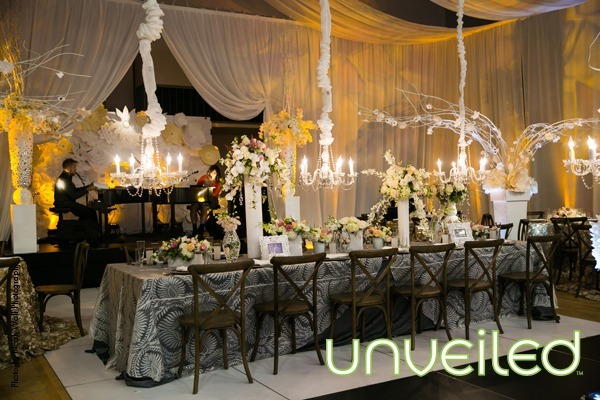 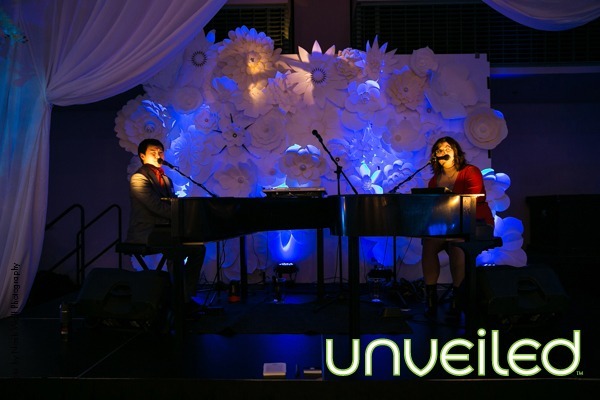 Creating another canopy above the entire space, we dressed the walls with white drape, utilizing flat panels of chiffon drape that created a fluid ceiling from the ceremony to the reception. 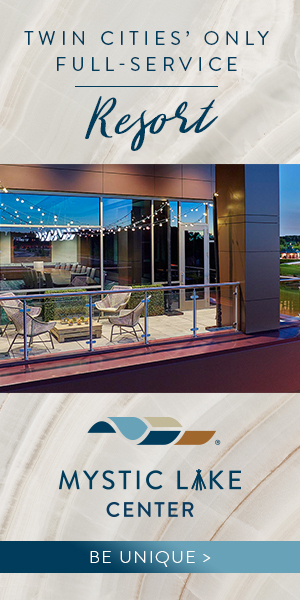 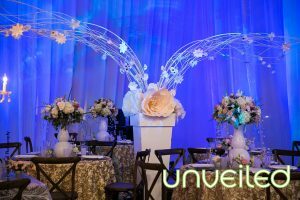 Patterned gobos that projected onto these surfaces created a whimsical environment that would evolve throughout the celebration, creating a space defined simply as: PETAL.